Chicken & Kidney, Duck & Lamb, Rabbit & Poultry, Turkey & Liver Enhance your cat's mealtime experience with our delicious FELIX® Adult Cat Mixed Selection in Gravy. Our assortment includes the delicious flavours of chicken with kidney, duck with lamb, rabbit with poultry and turkey with liver so your cat receives an exciting, varied diet every day! Purina vets and nutritionists have specially formulated our rich recipes to provide your cat with all he needs to grow into his adult years. 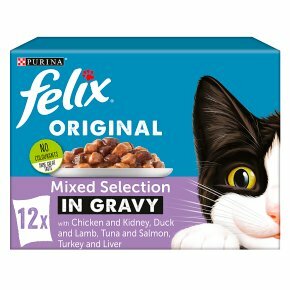 The meaty chunks combined with a rich, delectable gravy are sure to get your cat's mouth watering, especially with the choice of flavours available in this FELIX® Adult Cat Mixed Selection. Irresistible meals for mischief makers. 100% complete and balanced. Vitamins D & E. Balanced minerals. Source of omega 6 fatty acid. No added artificial flavourings, preservatives or colourants. That's not all! These classic Felix® favourites are a source of essential Omega 6 fatty acids with the right combination of balanced minerals and vitamins to help keep your cat full of vitality and ready for mischief! They're packed with healthy goodness and satisfy 100% of your cat's daily needs when served according to the feeding guidelines.